When Chelsea FC’s manger Jose Mourinho thought it a good idea to admonish club doctor Eva Carneiro in public for treating Eden Hazard on the pitch, he crank-started the journalisomobile. Michael Oliver, the referee, indicated that Hazard required attention. Mourinho felt that the more important factor was his team being down to nine men against Swansea (one had already been sent off). A secretary? Smell that whiff of sexism? “The Premier League Doctors Group considers that removing Dr Eva Carneiro from the Chelsea team bench for their next match is unjust in the extreme. The medical staff were clearly summoned on to the field of play by the match referee to attend to a player. A refusal to run on to the pitch would have breached the duty of care required of the medical team to their patient. “It is a huge concern that Dr Carneiro has been subjected to unprecedented media scrutiny and a change in her professional role, merely because she adhered to her code of professional conduct and did her job properly. 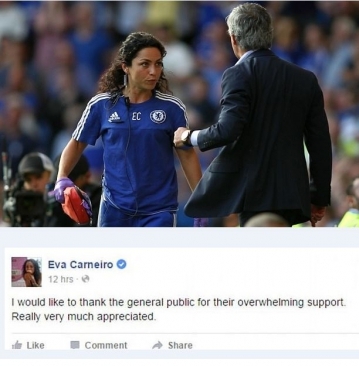 Dr Carneiro has universal and total support from her medical colleagues at the Premier League Doctors Group. Whether subliminally or accidentally or deliberately, Mourinho has implied that the doctor from Gibraltar has a lack of football knowledge that will make any subsequent appearances from her on the pitch more difficult, given that she already receives taunts for her gender from the terraces. What I really want to know is whether, if Carneiro was a man, Mourinho would have been so darned patronisingly angry with the medical team on Saturday, and if Carneiro is replaced by a man, whether he will be forced to agree that tactics come before health. And if he does agree to that dictum, does that make him a better football person or a worse doctor?